Posted on November 23, 2012 by Susan H.
I experienced my unique opportunity at my boys’ high school on Monday…I gave an Epi Pen presentation at their staff meeting. This is a picture of Matthew practicing at home with an expired Epi Pen…I was too busy to snap a few pictures at the meeting. My opportunity arose at the beginning of the 2012 school year. I mentioned to the Vice-Principal, at the boys’ high school, that I had some expired Epi Pens. 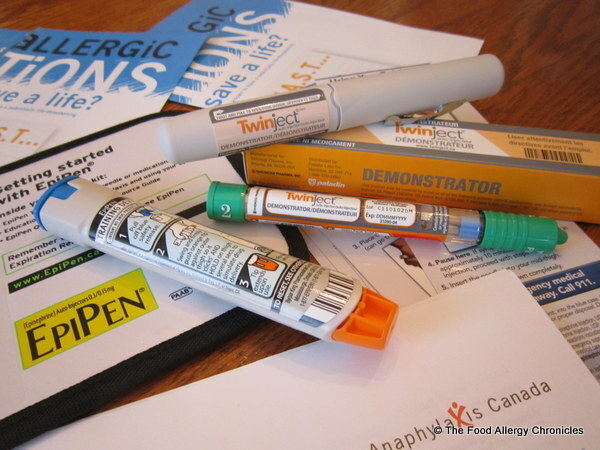 I explained the Epi Pen demonstration I presented to Matthew’s Grade 8 class at the end of the school year (May, 2012)…I had brought in a couple of expired Epi Pens for Matthew’s Grade 8 teacher and Epi Pen Buddy to administer in to an orange. The Vice-Principal was intrigued with the idea and came up with a plan…offer Michael and Matthew’s high school teachers the opportunity to practice with an expired Epi Pen on the first Professional Development Day. Unfortunately, that day did not work out…I was rescheduled for the next staff meeting. I knew I would have a limited time to speak/demonstrate/and have the teachers practice with the expired Epi Pens. As I tend to get carried away, ramble on and get lost in tangents…I called Anaphylaxis Canada for some advice. I have to admit…I was a bit nervous presenting in front of my boys’ entire high school staff. Good thing I practiced! What did I hope the high school teachers would take from my presentation and hands on experience with an Epi Pen? 1) All staff should know who the students with anaphylaxis are…by sight. 2) All staff should be able to recognize the signs and symptoms of anaphylaxis. 3) All staff should be trained in the proper administration of an Epi Pen and follow-up (delegate someone to call 911 and report back, delegate someone to retrieve the backup Epi Pen from the office, treat for shock, note time of administration, administer second Epi Pen if signs and symptoms worsen, call emergency contact, wait for ambulance) to eliminate any hesitation and delay of medication. 4) Together we can save a life. Overall, I was extremely pleased with how many teachers were eager to try out the expired Epi Pens. Many teachers had lots of questions…it was a bit chaotic…an adrenaline rush…it was a unique opportunity for the high school teachers to partake in…I hope I made an impact…I would do it all again in a minute! I felt very honoured to have been invited to speak about Anaphylaxis and the Epi Pen in front of my boys’ high school teachers…I believe it was a first for all of us. Thank you so much! This unique opportunity opens the doors of communication which is imperative when dealing with teenage students in high school settings with anaphylaxis. Increasing awareness and education of anaphylaxis and the proper administration of an Epi Pen without hesitation, I believe, is key to saving lives. I hope this is the first of many presentations! P.S. 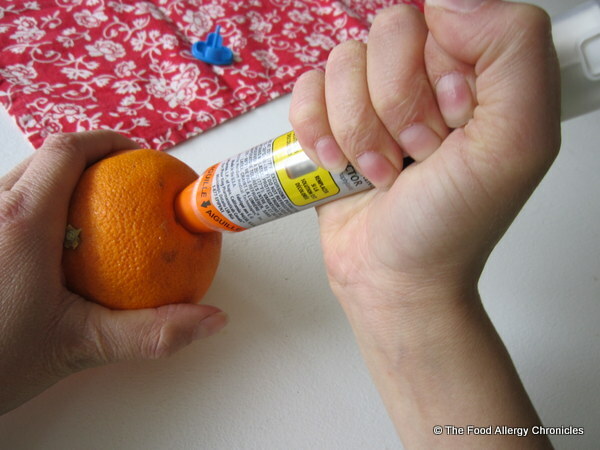 Have you ever practiced with your expired Epi Pens in an orange? What did you think about it? Do you own an Epi Pen or TwinJet Trainer? 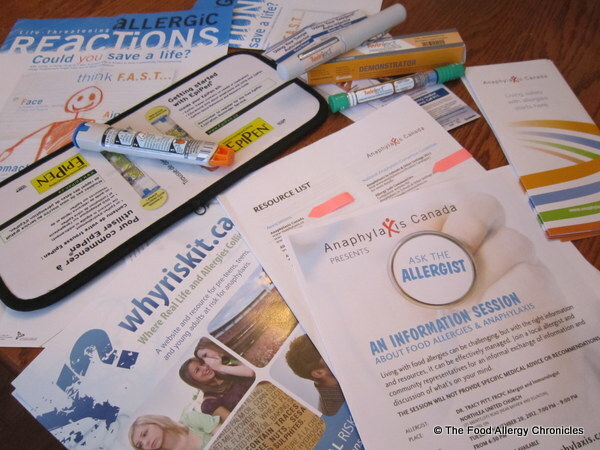 This entry was posted in multiple food allergies, school and tagged anaphylaxis canada, My Epi Pen Presentation at my boys' highschool, What to do with expired Epi Pens by Susan H.. Bookmark the permalink. What an invaluable lesson you gave those teachers. I am frankly quite shocked that they had never practised with a demo Epi Pen before! Our staff reviews the administration of the Epi Pen and all the procedures around it every year at the very first meeting. Usually there is someone on staff who needs to carry an Epi Pen or one of their kids does so he or she gives the demonstration and every two or three teachers gets an orange to practise on. At this meeting the photos of the students with allergies are posted on the smart board and every teacher gets a printout with smaller pictures of all the kids in the school with allergies and a list of their particular allergens. Of course, because of my long friendship with you, I am very vocal about the little things, like frequent and thorough handwashing so that door knobs and chair backs don’t become infested with those allergens that are not completely banned at the school, such as eggs, and fish. Keep spreading the word, Susan. Our kids are worth it. Susan, you are just wonderful! God has put the right woman in this position!! 🙂 You truly help & inspire so many people!! You never know how many lives down the road could be saved because of one of your demonstrations! !